Jean Ford’s reputation transcends party lines and politics to all concerned with the quality of life in Nevada. Born Imogene Young on December 28, 1929, Ford crossed the states of Oklahoma and Missouri to Texas in her early years. She received her B.A. in sociology from Southern Methodist University in 1951. Ford served as a recreational therapist at various military hospitals until marrying Samuel Ford in 1955. In 1962, the Fords moved to Las Vegas, where she spent the next several years involved in the care and activities of their two daughters, Janet and Carla. This however did not keep Ford from immersing herself in community activism. In 1964 and 1965, she chaired the Ad Hoc Library Committee, bringing about the creation of the Clark County Library district. Recognizing her leadership potential, Governor Paul Laxalt appointed Ford to the Nevada State Park Commission in 1967. On the commission she lobbied for state park budget increases and organized public support for a successful $5 million bond in the 1970 ballot. Ford continued her involvement with statewide issues and organizations while setting the stage for her political debut. Officially entering the political arena in 1972, Ford served two terms as a Republican in the State Assembly. Defeated in her 1976 bid for Senate, she nonetheless returned in 1978 and campaigned successfully for a Senate seat as a Democrat. During her time in the Nevada Legislature, Ford concerned herself with issues of the environment, education, and women’s rights, including the Equal Rights Amendment. While keeping involved in statewide politics, Ford turned her attention to business pursuits and opened her own tourism company. After a term as director of the state Office of Community Services, she moved to academia where she served as director of the Women’s Studies Program at the University of Nevada, Reno. Ford was a self-trained historian yet played an enormous role in preserving the history of women’s accomplishments in the state. 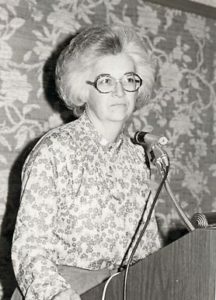 She began the Nevada Women’s Archives in collaboration with the University of Nevada Reno. She also founded the Nevada Women’s History Project, a state-wide volunteer organization that preserves the contributions of women in our state. Diagnosed with inoperable cancer in 1997, Ford hastened to finish projects and commitments, including narrating her own oral history—a wealth of Nevada history in itself. Friends and acquaintances poignantly note that the anniversary of Ford’s death, August 26th, is also the anniversary of Women’s Suffrage in our country and the celebration of Women’s Equality Day worldwide—a fitting tribute to one of Nevada’s finest. Source: Jean Ford: A Nevada Woman Leads the Way (Reno, NV: University of Nevada Oral History Program, 1998).